Baudette MN, make sure you have these items in your tackle box! 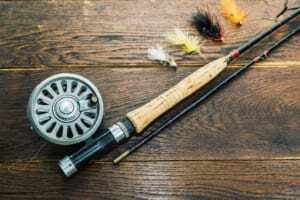 Beyond the tackle box, a rod or a reel are going to be your number one buddies to help you capture your prized trophy! Inside your box though there are some much-needed items. A line will help you cast your bobbers and lures ways out from your boat, just make sure you have extra in case the line breaks, or you need to cut it. You’ll want to have your lures, bobbers, leaders, and sinkers in there, as well as, different sized hooks for catching different types of fish. Beyond that, a needle nose plier, a sharp knife, and a nail clipper might come in handy. Rounding out your tackle box will be an essential first-aid kit, insect repellent, and sunscreen! No matter what type of fish you’re going to go for, a tackle box on the Lake of the Woods and Rainy River are essential must-haves for any fishing trip! Spend your days relaxing, chatting, and bonding with friends and family during your time with at the best Lake of the Woods resort, River Bend’s Resort and Walleye Inn!